“I still have my own race programme, I have my own targets, but you have to give a little also. Maybe the new signings will help, maybe take a bit of pressure off." 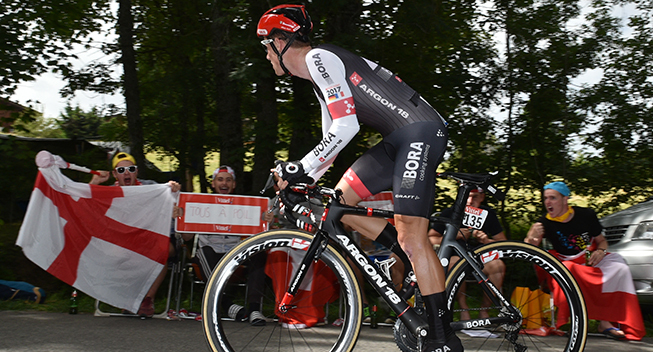 2017 changes a lot for Sam Bennett (Bora - Hansgrohe) who finished last in the Tour de France this year. Following his terrible crash at the finish of the first stage which also involved Michael Morkov, he finished as lantern rouge which had more finishers than any other edition. This meansthat he is the only rider in history to have finished in 174th place of a Tour de France. That said, it was especially his courage that got attention. But the real change doesn’t come from that feat. Until now, he has been the main sprinter of a Professional Continental team but as Bora-hansgrohe is now a WorldTour team with Peter Sagan in its ranks, he can no longer hope for the same status. “I still have my own race programme, I have my own targets, but you have to give a little also. Maybe the new signings will help, maybe take a bit of pressure off,” he says. Bennett also explains how his Bora - Hansgrohe team is evolving and changing. “We are doing a lot more testing and seeing how my body reacts to training, what I need to work on and what I can improve in. I think things are going to be a lot more detailed this winter,” he said. However, there are no guarantees that the arrival of Sagan will take awat much pressure from Bennett. While it is true that one always expects a sprinter to win a lot in a Continental Professional team which has to secure invitations, the fact that Bora - Hansgrohe joins the World Tour in the year in which ten new events are added, also means that every team will have to win even more than the World Tour teams have done so far. This means that Bennett will still have plenty of opportunity to get results. Bennett will start in Australia, where he will probably work for World Champion Peter Sagan. He was then scheduled to go to Qatar, but the race was canceled a few days ago. Bora must therefore look for an alternative. Bennett will do Kuurne-Brussels-Kuurne and it is unknown whether he will ride with Sagan there. He will most likely have the opportunity to play his card at Paris-Nice since Sagan is used to doing Tirreno. At Milan-Sanremo, it will be all for the Slovak. After that, it should be carte blanche for Bennett at the Tour de Catalunya, Scheldeprijs and probably the Frankfurt Grand Prix. He will then head to the Giro where he will be the main sprinter of the team. In 2016, Bennett took three victories: the first stage of the Critérium International, the second stage of the Tour of Tuscany and Paris-Bourges.